Nothing beats the feeling of being outdoors in your yard on a balmy night, but unless you live in a place that’s warm year round, your time to enjoy that al fresco experience is limited. But it doesn’t have to be. When the late summer/early autumn air turns chilly, don’t say goodbye to your outdoor living space; instead, install a heating unit. • A freestanding heater sits on the ground and can usually be moved around to your chosen spot. • A tabletop heater sits on a surface, like a dining table. Its size makes it the easiest heater to move but its petite stature also means its reach isn’t wide, making it best for small gatherings. • A mounted heater can cover a large area of your patio but not as much as a freestanding model. 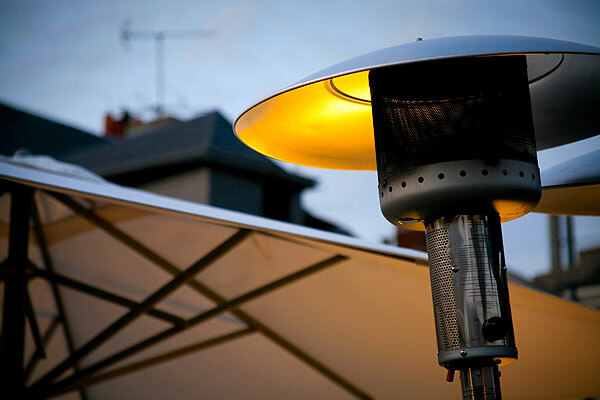 “Select mounted heaters have been designed so you can attach them to various backyard structures, such as a pergola,” says deGuzman, who advises homeowners to strictly follow the manufacturer’s recommendations on how and where you can mount the heater. • Electricity is convenient as long as there’s a nearby outlet to plug the heater into. (If you need an extension cord, be careful that it’s out of the way so no one trips on it.) An electric heater is easy to move from place to place since there’s no heavy power source to lug. One drawback: There’s no flame to stare into. • Propane is a flammable gas that produces a real flame. Heaters with a propane tank are easy to install, and they can be placed wherever you want since the fuel is self-contained, and they don’t need an outlet or gas line. But because the fuel is carried within the unit, it can be heavy to lug around. Hire a licensed pro for installation. • Natural gas comes from your home’s gas line, so you never have to refuel the heaters as you would with propane. A plus is that it produces a real flame. A minus is that the units can’t be moved around since they’re reliant on a fixed gas line.